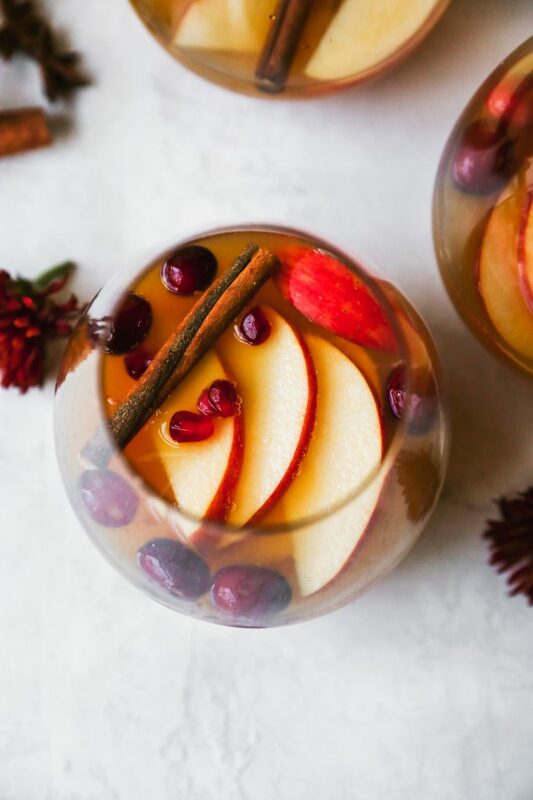 I have the perfect last-minute cocktail to serve for Thanksgiving. Well, it’s a mocktail. But it can easily be made boozy, if you want! Given that I’m pregnant, I am always on the hunt for a good mocktail. Luckily, they are a trend at restaurants and bars now (which was not so true my last pregnancy). I think it’s great. It’s awesome that places are being more sensitive to people who cannot or do not want to drink alcohol. Not everyone wants Coke, ya know? I love it when I have that option when out to dinner, because one of my most favorite things ever is getting a fun cocktail to kick off a night of eating! A mocktail helps lessen the blow of not being able to do that at the moment. 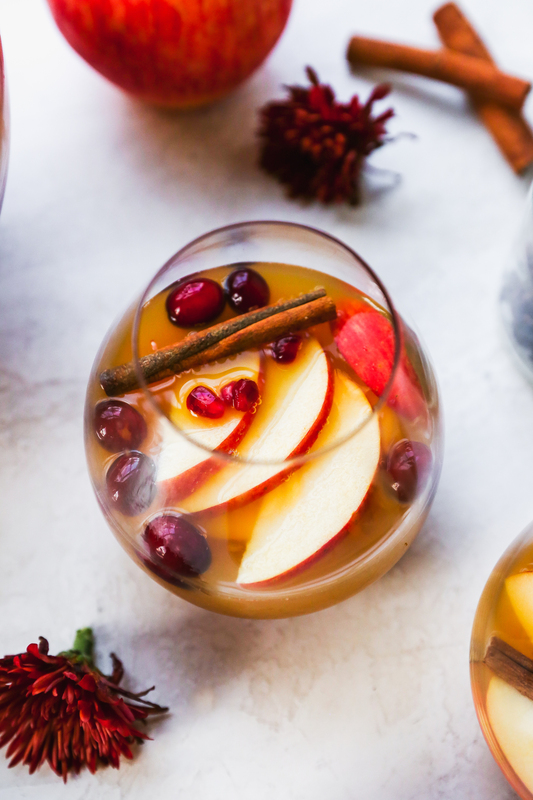 Speaking of a night of eating, this mocktail/cocktail is ideal for serving to a crowd on Thanksgiving (or any other time, really). It’s full of fall flavors and tastes like a cozy dream. Plus, it makes a large batch, which can easily be adjusted based on your needs. It starts with a spiced simple syrup. I take cinnamon, ginger, star anise, and honey and infuse them into a simple syrup that really takes this drink to the next level. It adds so much warmth and flavor! I definitely think it’s the game changer here. It makes this so much more than a glass of sparkling apple cider. I like to serve this up in a punch bowl because that just screams FESTIVE to me. People just get excited about a punch bowl. Don’t have one? No sweat. Just mix this in a pitcher and serve! Into the bowl goes the simple syrup, apple cider (get the good stuff), ginger beer, seltzer (orange is awesome! ), and fresh fruit! I like a mix of apples, pomegranate arils, and frozen cranberries. Sliced pears or oranges would also be great here. The frozen cranberries keep things nice and cold, too. Throw in a couple cinnamon sticks and star anise and you’re good to go. I like to make this ahead, chill it down in the fridge (right in the punch bowl), and then set it out with glasses. People can serve themselves and add ice if they like! 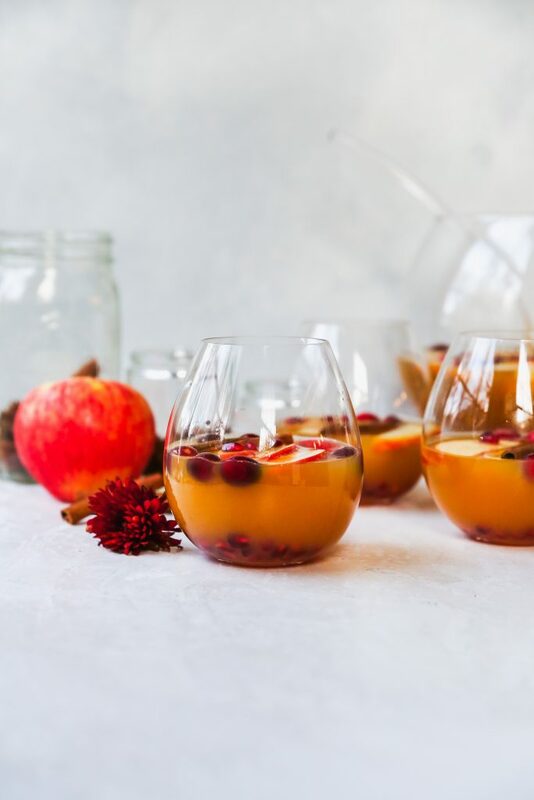 If I really have my act together, I freeze some of the apple cider in an ice cube tray and add that to punch bowl just before serving. 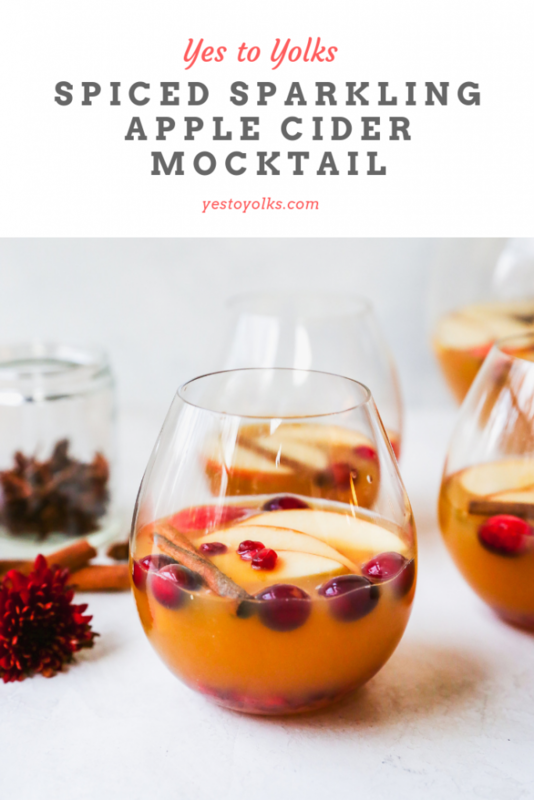 Serving drinks like this in a large batch format is so great for parties or holiday gatherings. You mix it once and then set it and forget it! People serve themselves and you can go about your hosting business without having to mix individual cocktails all day long. This drink is everything I love about this season. 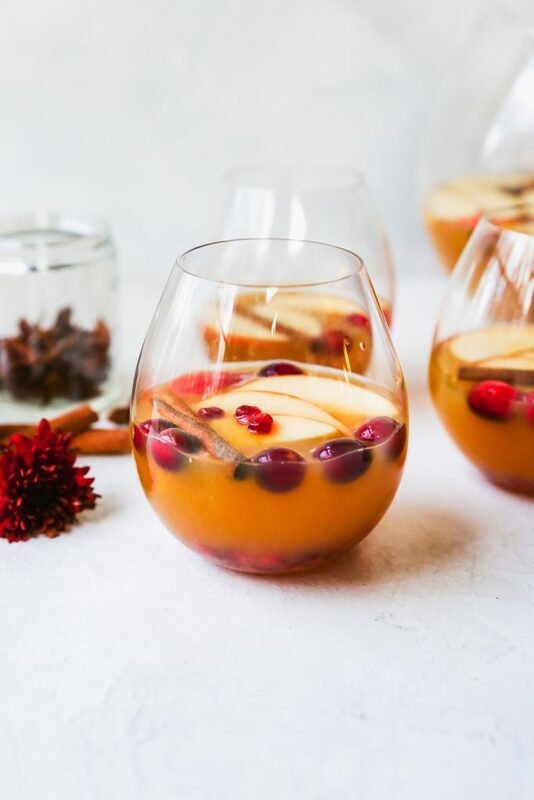 It’s sweet, spiced, effervescent, and totally festive. Plus, I find that MOST people love these flavors, so you’re guaranteed to have this entire bowl disappear. Combine the water, sugar, and honey in a small saucepot and set over medium heat. Bring to a boil, stirring frequently, and then reduce the heat to a simmer. Cook for a few minutes, stirring every now and then, until the sugar and honey completely dissolve. Add the spices and remove the pot from the heat. Allow the spices to steep in the syrup until it is cooled to room temperature. Strain out and discard the spices (or save for adding to the cocktail). If making ahead, store in an airtight container in the fridge (this is how I store any leftover syrup as well). 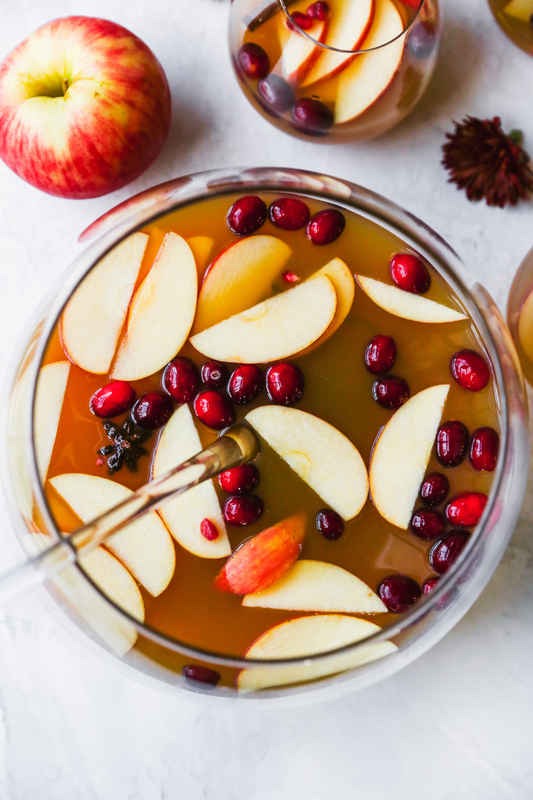 In a pitcher or punch bowl, stir together the apple cider, ginger beer, seltzer, and spiced syrup. It’s best if all your ingredients are chilled ahead of time. Add more syrup, to taste. If it tastes too sweet with only the ½ cup of syrup, add some more seltzer. This is definitely a “to taste” recipe. Add in the sliced apples and pomegranate arils. Refrigerate until you are ready to serve. Just before serving, add the frozen cranberries. Serve in glasses over ice. This can easily be made a boozy drink. Bourbon, vodka, spiced rum – any of them would work beautifully here. I would add 1 cup of the liquor along with another ½ cup of your favorite orange- or apple-flavored liqueur or brandy. Yum!